Amazon has just announced its third generation of Kindle Fire tablets, going by the "Kindle Fire HDX" branding, along with a refreshed version of the older Kindle Fire HD at a new low price. Starting with the new devices, the Kindle Fire HDX comes in a familiar 7-inch and 8.9-inch varieties, both with upgraded specs all around. Both HDX models feature quad-core 2.2GHz Snapdragon 800 processors, 2GB of RAM, 16, 32 or 64GB of storage and new higher-resolution displays. Those displays clock in at 1920x1200 (323 ppi) on the 7-inch model and 2560x1600 (339 ppi) on the 8.9-inch — which also has a new 8MP rear camera. Amazon says that the overall weight of the HDX has improved dramatically as well. The HDX 8.9-inch is 34 percent lighter than the previous model (just 13.2 ounces). On the software side, the new HDX tablets are running Fire OS 3.0 "Mojito," which brings several new features like X-Ray for Music, Prime Instant Video downloads and updates to all of the pre-installed apps. Amazon is also introducing a new service it calls a "Mayday button," which delivers 24x7x365 tech support for your tablet for free. 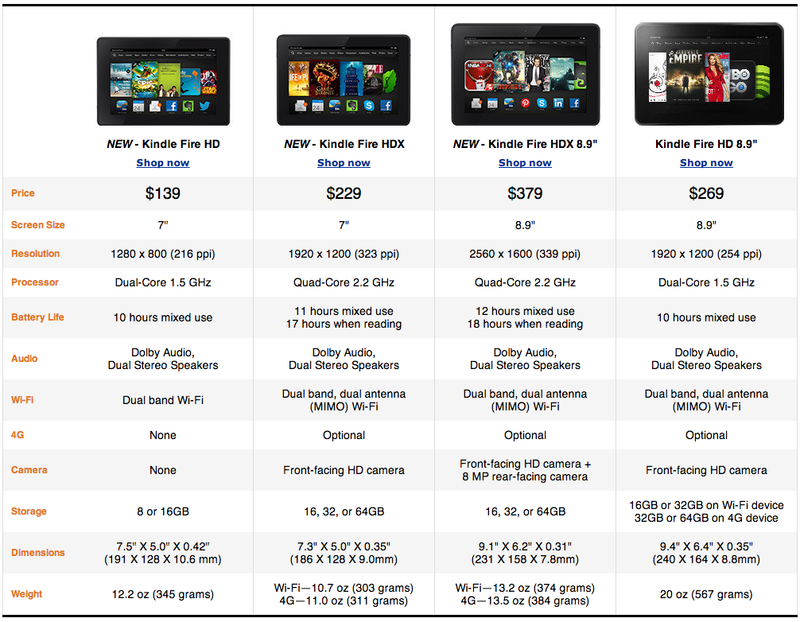 Pricing for the Kindle Fire HDX 7-inch starts at $229 for 16GB of storage, "special offers," and Wifi-only networking. You can pay $40 per storage increase, $15 to remove special offers and $100 extra to add either AT&T or Verizon LTE connectivity. Those of you playing at home will see that puts the highest priced model at $424. 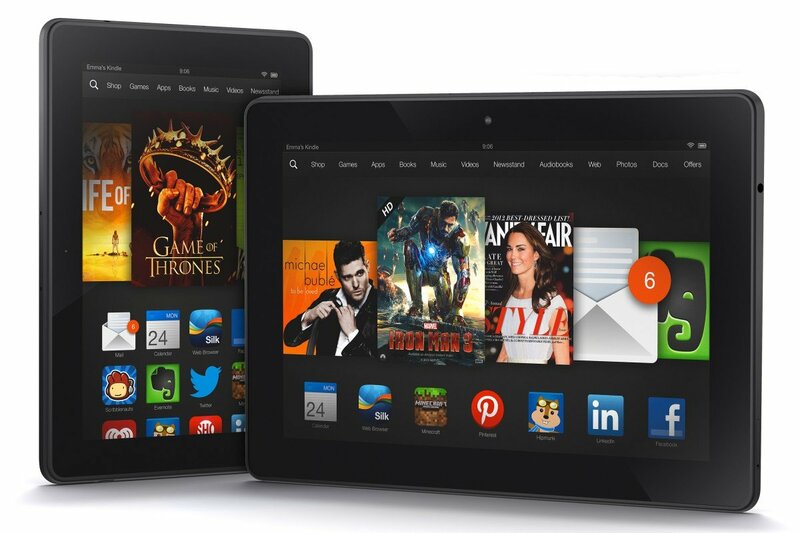 The Kindle Fire HDX 8.9-inch starts at $379 for 16GB of storage,"special offers," and Wifi-only. You can double your storage at each level for $50 more, remove special offers for $15 and add AT&T or Verizon LTE for $100 extra. The most expensive model is then $594. In case you weren't overwhelmed with all of the hardware news already, Amazon is also announcing a refreshed version of its Kindle Fire HD 7-inch at a new lower price. Now starting at just $139, the new Kindle Fire HD has a 1280x800 display, a dual-core 1.5GHz processor, dual stereo speakers and the new Fire OS 3.0 operating system. The casing is also thinner and lighter just like the new HDX tablets.